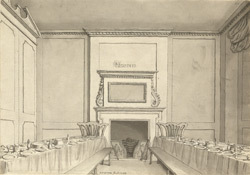 A view of the interior of a room at the inn in Salt Hill, prepared for the "Montem" dinner in 1793. This extract from Magna Britannia  describes the Eton School tradition, "This procession is made every third year on Whit-Tuesday, to a tumulus near the Bath road, which has acquired the name of Salt-hill, by which also the neighbouring inns have been long known. The chief object of the celebrity is to collect money for salt, as the phrase is, from all persons present, and it is exacted even from passengers travelling the road. The scholars who collect the money are called salt-bearers, and are dressed in rich silk habits. Tickets inscribed with some motto, by way of pass-word, are given to such persons as have already paid for salt, as a security from any further demands. This ceremony has been frequently honoured with the presence of his majesty and the royal family, whose liberal contributions, added to those of many of the nobility and others, who have been educated at Eton, and purposely attend the meeting, have so far augmented the collections, that it has been known to amount to more than 800 l. The sum so collected is given to the senior scholar who is going off to Cambridge, for his support at the university".